Following the tragic but not altogether unexpected death of MCA of the Beastie Boys, I've been on the lookout for other celebrity death news. 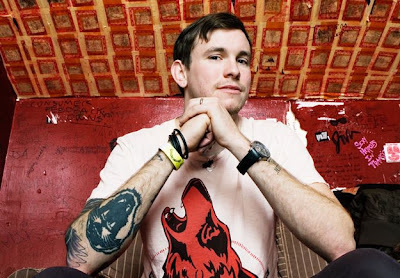 Tom Gabel, of punk-rock band Against Me! has acknowledged that he is transgender. He will begin to dress and live full-time as a woman, begin hormone therapy, and legally change his name to Laura Jane Grace. Tom acknowledges that she has been very unhappy with her body for a very long time, feels a legitimate sense of body dysmorphia, and is seeking to become comfortable in her own skin. The hardest part? Worrying how her wife would handle it. Tom and her wife are going to stay together. They have a child together, a two year old. They still love each other, Tom just needs to change something in herself. She makes no reference to sexuality, merely her own gender identity expression. Laura's going to make the same music, just maybe she'll sing the high-end now. That's about the only real change here. This is just wonderful for two reasons, immediately in that a prominent individual came to the conclusion that he was unhappy and was able to honest with himself and his loved ones, and those who surround him about what he needed to do to be happy with himself. Tom Gable did not kill himself or spiral into self-loathing and hatred, ultimately pushing away his loved ones and dying miserable, likely well before his time. So far, I have not read anything negative, only supportive, caring reports honoring Gable's bravery to openly transition. That attitude, that this is something uncommon but not so much so as to be out of the realm of the normal and acceptable, leaves me elated. Truthfully, I'm more accepting of this than I am liposuction. What gets me even more excited is that the above article, admittedly on HuffPost, doesn't miss a beat in immediately referring to Gable as "her" in the third person. That's amazingly thoughtful, if the author did it on purpose, and heartsoaringly joyous if it was carried out without a moment's thought. If Gable says she's a she, HuffPost isn't one to disagree with her. Not their place or their job. For my money, Tom was a guy and he got a he, until he realized he wasn't and he shouldn't. The she was a she. Yeah, it makes past-tense a little confusing, but just pretend English is like any other language where pronouns are superfluous to verb conjugation. And while I'm sure there will be plenty of aggressively abusive responses to this story as well, it pleases the libertarian English major in me that the first place I read about a story is the place that respects the subject matter by swapping something as seemingly inconsequential as pronouns. Because I really don't think it's inconsequential to Tom.